MLB and the Nationals will host a Miracle League-Challenger Game. The special event will give children with special needs the opportunity to play baseball on the same field as the 2018 All-Stars, with the Miracle League playing with Little League's Challenger Division. Co-ed softball teams from the U.S. Army and the U.S. Air Force will make history as they compete in the Championship Game of the first All-Star Armed Services Classic presented by T-Mobile. Get tickets here. This game will feature the top Minor League prospects competing in a nine-inning contest. Buy tickets here. The All-Star Legends & Celebrity Softball Game is the second game of an exciting doubleheader at Nationals Park on All-Star Sunday, July 15. Check out the players here and buy tickets here. The stars come out Monday night to crush home runs out of Nationals Park! Buy your tickets here. The 89th annual Midsummer Classic will be held at Nationals Park and broadcasted on FOX. Standing Room tickets are still available! Buy them here. Measuring more than 145,000 square feet, the festive space will include a youth-sized turf diamond featuring daily scheduled programming and open-play, as well as batting tunnels, pitching inflatables, a “Stickball Alley,” food trucks and MLB Sponsor-activation zones. PLAY BALL Park will be open Friday, July 13 – Tuesday, July 17 and is located at Parcel A (at the intersection of First and M Streets). Times vary. 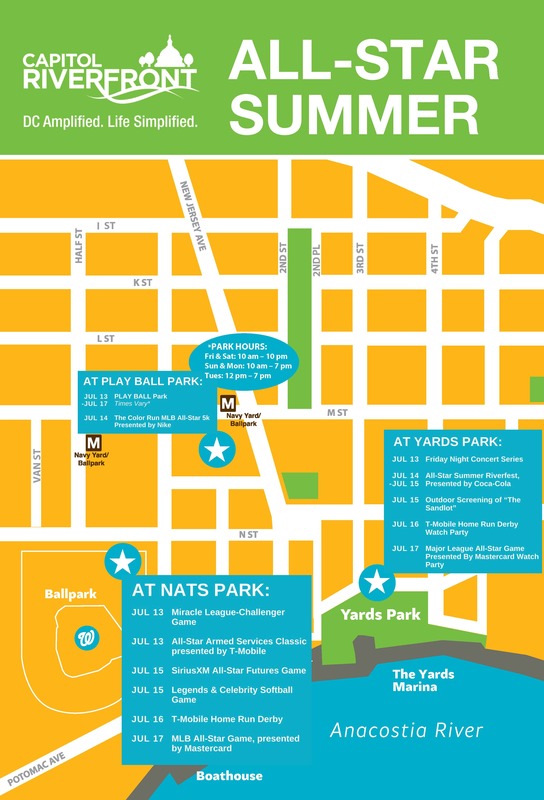 Meet at PLAY BALL Park for a pre-race party with music, dancing, warm-up stretching and giveaways before taking off on an untimed run around the Anacostia River, through Anacostia Park and Yards Park. Price: $43-$48; register here. We are hitting our outdoor movie series out of the (Canal) park this week with a special screening of A League of Their Own on the Great Lawn in Yards Park. Yes, you read that right, this week’s outdoor movie will be screened in Yards Park and not Canal Park. 19th Street Band is bringing a fusion of Americana, country and rock to the Corona stage in Yards Park this Friday! Our favorite seasoning of the summer, Old Bay will be on the Boardwalk passing out swag! The Yards and the Capitol Riverfront BID will host an unforgettable family-friendly All-Star Summer Riverfront Festival at the Yards Park Boardwalk. The Yards Park will be transformed into a real-life sandlot where attendees can enjoy live music, pop-up bars, tasty food, photo booths, baseball-themed activities, and games including bocce, sand art and oversized board games such as Scrabble and Chess. This event is free and open to the public. Food and beverages will be for sale. We are doing a baseball movie doubleheader this week! Catch a free screening of The Sandlot in Yards Park starting at 9pm on Sunday night! The Yards and the Capitol Riverfront BID will host a waterfront watch party for the 2018 T-Mobile Home Run Derby telecast by ESPN on the Boardwalk in Yards Park. Food, drinks, and games will be provided with incredible views of a megascreen to watch the game just steps away from Nationals Park. This event is free and open to the public. The Yards and the Capitol Riverfront BID will host a waterfront watch party for the 2018 Major League All-Star Game presented by MasterCard on the Boardwalk in Yards Park. Food, drinks and games will be provided with incredible views of a megascreen to watch the game just steps away from Nationals Park. This event is free and open to the public. Larger than life-sized inflatable installations will be featured throughout Yards Park and Canal Park, including 15 eight-foot baseballs repping all MLB teams and two 12-foot baseball gloves offerings baseball lovers the perfect Instagrammable photo opportunities to enjoy before or after a game or dinner along the riverfront. District Winery welcomes the MLB All-Star festivities with a special All-Star wine flight at their tasting bar for $14 and an "upscale tailgate" experience on the private rooftop terrace Friday and Saturday. Open to the public, no tickets necessary. Mission will open at 1221 Van on Saturday serving up tacos, appetizers, and a sampling of entrees. Enjoy food and the whopping four bars inside with 16 draft lines for beer, margaritas, cocktails, wine, and prosecco. Up Top Acres is opening up the rooftop to celebrate DC United's first home game! Gather on the roof for drinks, games, and a screening of DC United v. Vancouver Whitecaps. They will have a bar serving beer + wine. Feel free to bring your own snacks and make a picnic of it! Price: $10; get your tickets here. All-Purpose Capitol Riverfront is now offering Bottomless Brunch with a menu featuring brunch specialties, cocktails, bottomless mimosas, bellinis, and aperol spritzes. The Brig will open early this weekend, at 10:00 am Saturday and 10:30 am Sunday, with drink specials for World Cup Finals. Declaration will offer hot dogs inspired by five different major baseball cities: D.C., Los Angeles, New York, Chicago, and St. Louis for $8. The Salt Line will open up a Jack Daniel's All-Star Park in their outdoor lounge area at 3:00 pm Saturday through Tuesday. They'll be grilling up half smokes and lobsters as well as offering up oysters grilled on the half shell. Get in the All-Star spirit at Willow! On Saturday and Sunday, they will be having an All-Star Sale which includes 20% off select items, 60% off sale rack. They will also have complimentary cupcakes, fruit skewers, and pink lemonade moscato. Be sure to stop by on Tuesday, July 17 when they are giving away a free DC flag shot glass with every purchase of $10 or more! Ice Cream Jubilee is giving out free mini-scoops of Snickers Snickerdoodle with the purchase of a regular-size scoop, sundae or pint. This is your chance to try out Snickers Snickerdoodle (cinnamon ice cream with chopped pieces of Snickers candy bar) before it becomes available in scoops form several months from now. Up Top Acres is partnering up with the team from Bluejacket who will be slinging burgers and dogs all night, and serving up wine, and Bluejacket beers. You'll be able to hear the roar of the crowd from Nats Park while playing games and enjoying a screening of the Derby as soon as the sun sets. Tickets ($25-$35) will get you entry to the party, and they will be selling food and drink tickets on site ($4 per ticket). Get your tickets here. The Navy Yard is hosting a large private event prior to the All-Star Game. Expect large crowds moving through Yards Park around 7:00 pm as everyone from the event walks to the game. For a full list of restaurants in the Capitol Riverfront, click here. For a map of the activities in Capitol Riverfront this week, click here.